Sunday college basketball betting preview: Can balanced Minnesota hang tight with Purdue? Minnesota has covered three games in a row with a revenge win over Illinois and an upset victory over ranked Iowa, but they face a big test on Sunday against Carsen Edwards and the Purdue Boilermakers. 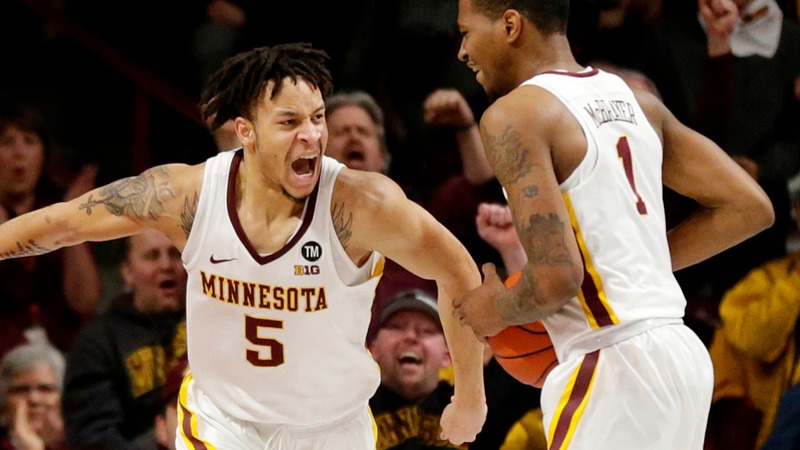 Minnesota has covered three games in a row with a revenge win over Illinois and an upset victory over ranked Iowa, but they face a big test on Sunday against Carsen Edwards and the Purdue Boilermakers. The Gophers are getting balanced scoring with five players averaging double figures, led by Amir Coffey and Jordan Murphy at 15 points a game each. That's the opposite of Purdue. The Boilermakers have Edwards scoring 24.9 points per game and Ryan Cline, a three-point specialist, averaging 13. But those role players thrive at home. In a 10-point win over Michigan State, Purdue got double-digit scoring from five players and survived Edwards shooting 4-of-19 from the field. Those non-Edwards players will be [important](https://purdue.rivals.com/news/purdue-basketball-goldandblack-com-preview-17-purdue-vs-minnesota) against a team in Minnesota that has struggled on the road at times. The Gophers have three road losses by 10 points or more, although they only lost by two in their last road game against Michigan. Minnesota is 113th in the country in scoring, but that rank drops to 249 on the road. Purdue is 50th in the country in opponents' points per game at home. One of Purdue's weaknesses is three-point defense, but it's hard to see Minnesota exploiting that. The Gophers as a team shoot 31 percent from three. Purdue survived its scare this week against Penn State, blowing an early lead and needing overtime to escape with a win. A return home off that game should be a recipe for success. While they're gaining helium and it may soon be time to fade the Boilermakers, it's a good spot to back them on Sunday. Ge Purdue is 26-12-1 against the spread as a home favorite since 2016 and cover by an average of 4.2 points per game. On the road this season, Minnesota fails to cover by an average of five points per game, the worst number in the Big Ten. ## Spreads and trends for notable Sunday games (Bovada) __Georgetown at No. 14 Villanova__ 11 a.m. Spread: Villanova -11 Total: 156 Georgetown has covered only eight times in its last 25 games but 4-1 ATS in the last five road games. __Minnesota at No. 17 Purdue__ 11 a.m. Spread: Purdue -11 Total: 148 __Xavier at Creighton__ Noon Spread: Creighton -6.5 Total: 154 __Play along:__ [Free daily contests to win great prizes! ](https://betchicago.chalkline.com/) Xavier is 1-5 ATS on the road, failing to cover by an average of five points per game.